This month I interviewed Czech woodturner Peter Hromek. I became aware of Peter's work shortly after I started working on the magazine and I have to say that some of his pieces feature among my favourites. The names he gives to his pieces are indicative of nature, and I love the way in which colour and texture is also incorporated into the turnings he creates. I wanted to find out more about Peter's background as well as what motivates him. Peter was born in the Czech Republic in 1947. "As a child I remember that I was a passionate collector of unusual pieces of wood, branches, or roots. I began to lightly shape these pieces into figures or jewellery. In the town where I lived at that time there were hardly any opportunities to see any handcrafted objects, although occasionally I saw photos of sculptures or Japanese flower art in magazines," he tells me. These images always fascinated Peter. Although he wasn't very motivated whilst at school, Peter remembers his training as a precision mechanic being great fun: "Years later, I discovered that work which required meticulous skill was my talent and vocation," he says. In 1969, Peter left the Czech Republic and went to Germany: "As an amateur musician I had a lot of friends who were interested in music; however, I wasn't such a good musician and I began to work with a friend of mine who made string instruments. I acquired all the literature I could find about string instruments, bought wood from a specialist wood supplier for these instruments, and started to learn how to make them," he recalls. Without a workshop and hardly any tools, but greatly motivated, Peter made his first instrument: "It was an American mandolin because I was able to borrow one to use as an example. Making this kind of mandolin is very similar to making a violin." Months later, he visited a master violinmaker to ask how he should finish the mandolin. He was so impressed with the quality and workmanship of Peter's first instrument that he not only gave him some tips regarding finishing, but also instructed him on some specific methods he used. "He told me that I had talent and encouraged me to continue. The next instruments were steel string acoustic guitars, which I sometimes sold to well-known musicians," he says. As a result, Peter made a living by repairing instruments. After several years, Peter wrote a book about how to build a guitar. He had hoped that this book would increase sales and create interest in his musical instruments, but unfortunately that wasn't the case. "Disappointed, the end of my career as an instrument maker coincided with the publishing of my book, Self Made Guitar." This book was translated and published in the United States. Today, Peter still thinks that he should have persevered and not have given up so easily. Before Peter started to make guitars he had finished his studies, receiving a diploma as a technician in the machine building trade, and he decided to return to this sector. "However, many things had changed because of the new computer technology, which I wasn't familiar with. I got a job in industrial construction. There were chemical plants built or renovated according to the newest environmental standards,â€� he remembers. Peter first started turning 23 years ago. In Germany at that time, there were virtually no other turners, and woodturning was an almost unknown medium. Peter sought inspiration from Richard Raffan's book on woodturning and design, and according to Peter, this became his 'bible.' "This book always accompanied me in my workshop. I used to turn many natural-edged bowls, vases, etc. which I still like to do to this day," he goes on to tell me. The first lathe Peter bought was a small mechanical lathe, which could be used as a woodturning lathe: "Since I had worked as a metal lathe operator, I understood the process and started to turn wood on this lathe using the scraping method. I had some successes and some failures, but my enthusiasm for wood and the notion that something practical could be made out of almost any piece of wood was an important thing for me. This was impossible when making guitars," Peter says. After a short time, he began to dream of making his living turning wood. He was given a copy of Woodturning magazine by an English friend, which proved to be his inspiration. "Up to that time, I had never seen anyone turning wood and didn't know if the methods I was using were correct or not. Five years after I had begun, I met two well-known turners, Melvyn Firmager and Dave Regester." Melvyn Firmager, who had also taught himself to turn wood, had created his own special hollowing tools. This opened up a whole new world for Peter. "I could make tools, too. 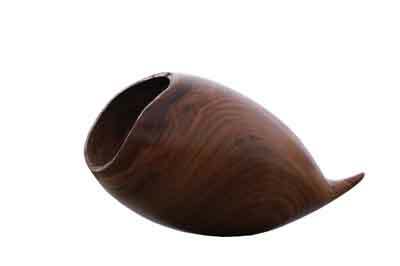 After these turning workshops I was determined to become a professional woodturner," says Peter. Now and then, Peter sold some turned vessels as well as working as a chef in a local restaurant to cover the bills. In 1993, two years later, he was accepted into the Hessian Artists' Association. "I gradually became known for my thin-walled vessels, vases, bowls, and hollowed objects," Peter tells me. Even to this day, Peter is still fascinated by beautifully grained woods, but finds that form has become the most important feature, and wood, for him, has become secondary, although this still remains the material of choice. "Vessels whose form is so powerful and compelling don't need any special, beautiful grain which could even detract. Looking at form as the focal point, I have envisioned forms which are no longer only round, but have other forms which can have different axes." Peter has spent a lot of time developing his skills and has learnt to turn objects which don't look as if they have been turned on the lathe. These objects are a result of turning, shaping, and a lot of work by hand. Today, when Peter designs his sculptural vessels he doesn't necessarily care much about the grain: "The wood becomes a carrier of form, but still has influence over the finished piece." Often at exhibitions or craft shows, people ask Peter if the objects on display are made of wood: "They ask me this, even when they are standing in front of the object. I could not understand this question because everybody could clearly see that the piece was made from wood, or so I thought. I then realised that they are not able to bring these kinds of forms together with wood as the material; they were expecting other materials." 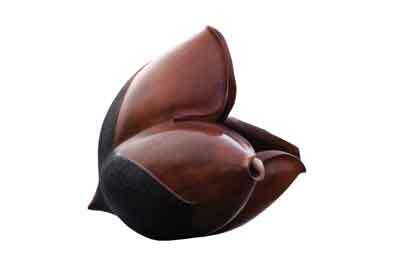 Peter now designs his forms consciously: "I carry the ideas for a few days or weeks in my head. Starting an object turned on three or four axes, I first make a technical drawing, which helps me to define the shape and how to chuck the piece; what part I am able to turn; what I have to mill, or make by hand. 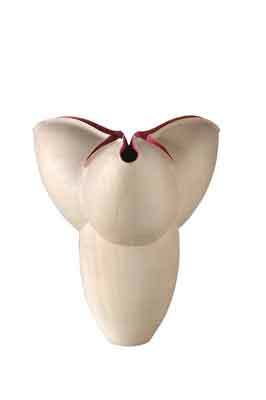 I know there are many woodturners that are moving away from turning to free shape," he explains. All Peter's pieces are hollowed out on the lathe: "Outside there might not be so much turning, then I work mostly with the Arbortech, but still on the lathe, sander or chisel. I have developed a few sanding techniques, and then the object is finished," he goes on to say. When Peter feels that his work somehow touches and enlightens the minds of the viewers, he then thinks he has done his job well: "Often people say that my work has some kind of sensual radiation. I like this idea but I don't want to be obtrusive." 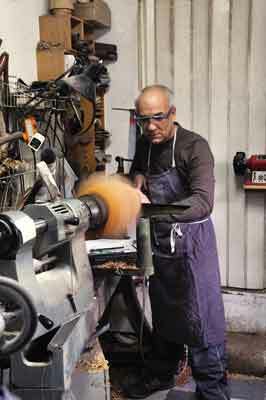 Peter's fascination with woodturning is about him discovering his own creative language, which expresses his work and cannot be confused with the work of anyone else: "To meet the challenge of mastering the precision, technique, and craft needed will communicate the feeling of a complete, harmonious and organic object, whose elegant simplicity and beauty touches the soul," says Peter. The book, Wood Vessel Sculpture, which Peter had published two years ago as a compendium of his woodturning activities of the last 20 years, features the following chapters: bowls, vases, boxes, spindles, sculptures and peppermills, which all show works from the earliest phases up to the present. Furthermore, a photo series reveals the process of a receptacle turned on four axes. The book is published in German and English. 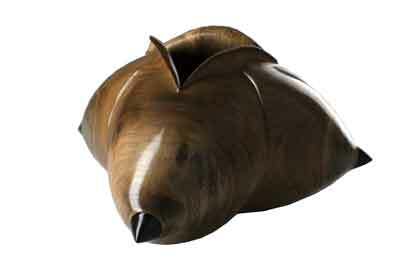 A year later Peter was invited by Terry Martin to be a part of the book, New Masters Of Woodturning. Over the years, Peter has exhibited his work internationally, winning many prizes along the way. The beauty and uniqueness of wood motivates him. 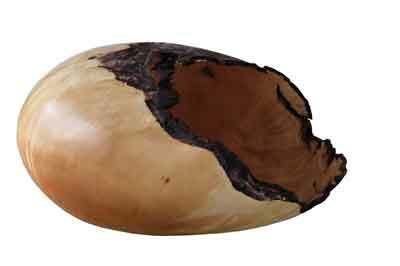 He cites the emergence of the object from the piece of wood as the most important aspect of the creative process. In terms of the future, Peter wants to experiment further with the surfaces of his turned vessels and try some teaching. Last year, Peter was invited to demonstrate at the annual AAW Symposium and this year he will be demonstrating in Australia and New Zealand. He is looking forward to seeing what happens there and potentially developing this. For more examples of Peter's beautiful and unique work, see details opposite. 2. I am really struggling to think of things I don't like about woodturning!